Welcome to Pebble Creek: Where the Past Haunts, Love Thrives, and New Challenges Wait Around Every Corner. 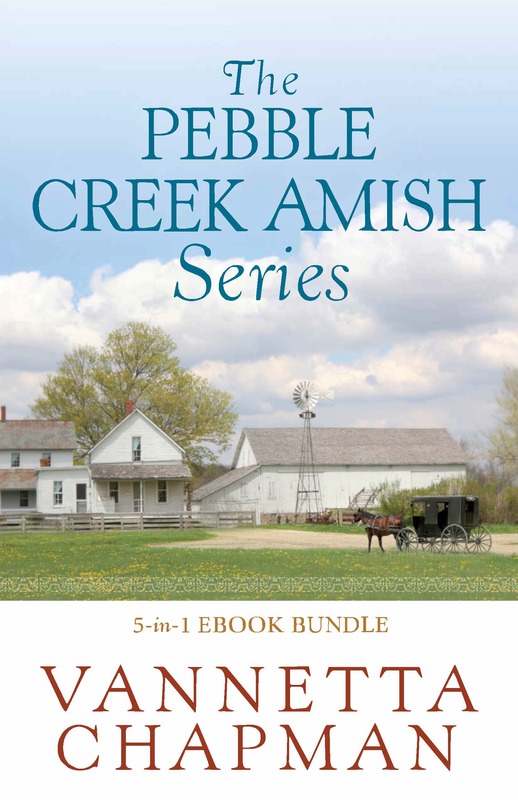 Collected for the first time in a complete, ebook-only bundle, find yourself transported to popular author Vannetta Chapman’s Pebble Creek Amish community in ThePebble Creek Amish Series 5-in-1 ebook! In this delightful series, the caring people of Pebble Creek encounter challenges from the English world and unify to reach out to their non-Amish neighbors, while carefully preserving their Plain ways. These unforgettable stories follow the lives of various Pebble Creek inhabitants such as schoolteacher Miriam King, Lydia Fisher the outspoken cabin housekeeper, and aspiring café owner Julia Beechy. Each woman experiences a life-altering journey of drama, romance, and the unexpected. This remarkable Plain community and their charmingly-told tales will lead to refreshed faith as you enter the endearingly unique world of ThePebble Creek Amish.